I hope readers gain an understanding of their own destiny as they relate to the religious struggles of each character. Jack Emberson’s new book, BREAKING NIMROD, ($17.99, paperback, 9781498465182; $8.99, e-book, 9781498465199) touches the last century of American experience and goes beyond. It travels the misunderstood balance in ministry and reviews the roots of religious control that can only be released in the beautiful freedoms found in relationship with the one who redeemed his people. Emberson introduces readers to a cast of colorful characters that experience an array of real life emotions including: rejection, control, verbal abuse, redemption, repentance, deliverance, fears, humor, and fun. The book follows generations of the Warwick family – a story describing how Frank Warwick and his family find faith in God through witnessing miracles and many remarkable experiences. It begins when a young Frank Warwick’s unearthing of the giant skeleton opened him to a world of fear – a traumatic encounter that would affect him for the rest of his life. The story leads into his crazy hot-rod cruisin’ son, Richard, who would uncover his father’s hidden past and lead him to redemption. This book is a must-have for those who sense the mystique of human experience – those brave enough to become vessels of what if and for the sake of what will be – those who see beyond time. At age twenty, Jack Emberson’s journey began New Year’s Eve 1970 on a street in California. The rise of the Jesus Movement equipped him with the vision of evangelism and personal calling. His experience in ministry and secular work equips him to share revelatory leadership insights that impact the world as a whole. Xulon Press, a division of Salem Media Group, is the world’s largest Christian self-publisher, with more than 15,000 titles published to date. 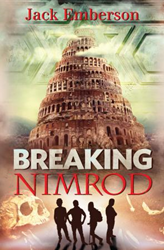 Retailers may order BREAKING NIMROD through Ingram Book Company and/or Spring Arbor Book Distributors. The book is available online through xulonpress.com/bookstore, amazon.com, and barnesandnoble.com.